MLK Day of Service is an opportunity to remember history and re-commit ourselves as citizens by volunteering in service to one another. It is also a time to consider how much work still remains to fulfill Dr. King’s dream. We at Common Impact believe service is a powerful tool for strengthening the communities in which we live and work. At the end of last year, our staff spent some time reflecting on (and discovering!) what truly motivates us to do the work we do every day to fulfill Common Impact's mission. 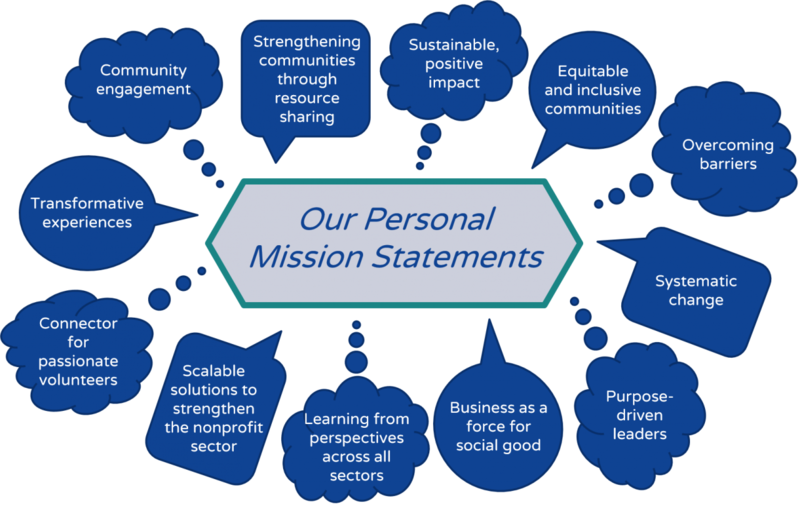 Check out our mission statements below to get some inspiration to make this MLK Day a day on and not a day off. Jackie - I’m motivated every day by my job at Common Impact because I get to work with amazing people who are impacting their communities in different ways. I learn so much about myself, social change, and these different sectors from interacting with and hearing the perspectives of the Common Impact team and our corporate, nonprofit, and public partners. Molly - My mission is to drive systemic change by creating transformative experiences for individuals and organizations. Common Impact programs build partnerships between people from across sectors, backgrounds, and experiences. The immediate results of these partnerships are new, scalable solutions that strengthen the nonprofit sector's ability to serve those in need. On a larger scale, this union of unlikely partners chips away at the silos between sectors by connecting a generation of purpose-driven leaders to one another and to their communities. Lauren - I am driven to break down barriers for nonprofits to more effectively achieve their missions by leveraging business as a force for social good. Even if my work can only solve one piece of the puzzle, it is motivating to see a real difference, real impact and real development take place across all sectors to solve critical social challenges in our communities. Andy - I strive to help bring about a community in which all people—especially those on the margins—are empowered to live fulfilling lives. I feel privileged to work at Common Impact to support nonprofits that make our communities more equitable and inclusive. Drew - I am confident that our society has room for businesses to prosper on being benevolent and mission-driven and for nonprofits to flourish on being innovative and cutting-edge. I am empowered in my work by my belief that bridging the gap between nonprofits and corporations is a route towards mutual success. In a world of drawbridges, this isn’t always easy, but investing in talents has proven to be an effective method for constructing accessible and lasting partnerships. Marjie - I believe in the power and importance of the nonprofit sector to address the critical issues facing our communities every day. I am honored to support these organizations and the professionals that are on the front lines making a difference and to serve as a connector for passionate volunteers to channel their skills into impact. Marielle - A decade working with high-impact nonprofits has taught me that we are strongest in partnership – smart cross-sector collaboration helps nonprofits scale their efforts with additional resources and expertise, and secure lasting social change. I am therefore inspired daily by my work at Common Impact, learning about the many fascinating ways nonprofits in our communities are addressing social challenges, assessing the organizational constraints they face, and designing projects with our corporate partners to overcome barriers and maximize the positive impact of these organizations. Season - My personal experience growing up in a single parent household and the struggle and resiliency it created serves as a catalyst for me to be immersed daily in community engagement that creates greater awareness and social change. I’m so proud that Common Impact, through its partnerships and accomplishments, stands strong for change and growth! Krista - I am inspired to spark a social and environmental movement through business. Common Impact makes that possible by engaging corporate resources with local nonprofits to deliver sustainable, positive impact in our communities. Our incredible and growing network of volunteers proves that large-scale change is possible when you connect business strategy to the common good, and I am honored to be a small part of this important work. Elif - Working at Common Impact, a non-profit organization, I love that our non-partisan mission allows us to engage with many non-profits and by extension assist not one but several communities simultaneously. Our collaborations are not just transactional; we ensure that our corporate partners channel their resources efficiently by having their employees partake in our projects, where they have the opportunity to volunteer their time and skills to leverage non-profits core competencies. As a project consultant at Common Impact, I am part of a savvy and resourceful team that utilizes data and technology in crafting the most meaningful and cost-efficient projects for our partners!